A football player caused stirs and emotional reactions on Tuesday night as re rushed off the football pitch to attend to his wife who went into labour during a match. Joe Day is a goalkeeper who plays professional football in the fourth tier of English football for League 2 side, Newport County. 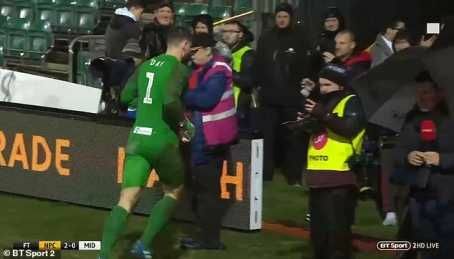 Joe was seen on live television as he dashed off the field and cut short his team’s celebrations to be beside his wife who gave birth during the match. His team defeated Middlesbrough 2-0, in the English FA cup replay match, with Day manning the posts. The 28-year-old, who had his phone turned off during the game, dashed off the field immediately after the final whistle to request permission from coach Michael Flynn to go see his family. Humbsblog.com however reports that Newport have a huge task ahead of them as they face Manchester City in the next round of the competition.